Do you remember your first instrument, the first device you used to measure something? Perhaps it was a ruler at primary school, and you were taught to see distance in terms of centimetres or inches. Before too long you learned that these units are only useful for the roughest of jobs, and graduated to millimetres, or sixteenths of an inch. Eventually as you grew older you would have been introduced to the Vernier caliper and the micrometer screw gauge, and suddenly fractions of a millimetre, or thousandths of an inch became your currency. There is a seduction to measurement, something that draws you in until it becomes an obsession. 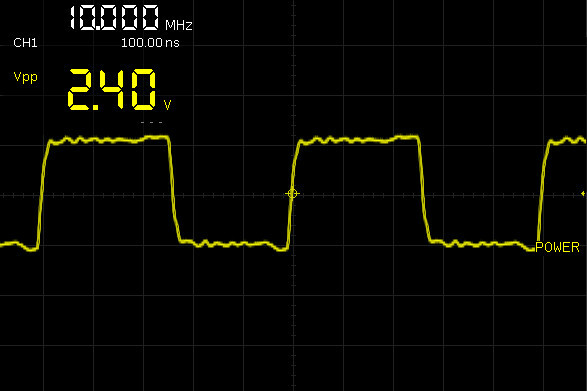 [Paulie] over on the EEVBlog forums picked up an inexpensive frequency counter on eBay and realized it was just a little bit off. As a result, he decided to build a frequency standard. His build wound up costing him about $3 and he shared the design and the software for it. The hardware design is very simple: a TCXO (also from eBay), an ATMega8, a pushbutton, and a AA battery with DC to DC converter to power the whole thing. The software does all the work, providing frequencies from 10MHz down to a few hundred hertz (including some common audio test frequencies). If you haven’t worked with a TCXO before, it is a crystal oscillator that includes a temperature compensation circuit to pull the crystal frequency up or down depending on temperature. Although crystal oscillators are pretty accurate already, adding this temperature compensation improves accuracy over the design temperature dramatically (typically, 10 to 40 times better than a naked crystal oscillator). If you want to learn more about TCXOs, here’s a good write-up. A TCXO isn’t as good as an OCXO (where the first O stands for Oven). However, OCXOs cost more, are larger, and drain batteries (after all, it is running an oven). You can even hack your own OCXO, but it is going to cost more than $3. If you want to see the real guts of one TCXO, check out the video. A rubidium standard, or rubidium atomic clock, is a high accuracy frequency and time standard, usually accurate to within a few parts in 1011. This is still several orders of magnitude less than some of the more accurate standards – for example the NIST-F1 has an uncertainty of 5×10-16 (It is expected to neither gain nor lose a second in nearly 100 million years) and the more recent NIST-F2 has an uncertainty of 1×10-16 (It is expected to neither gain nor lose a second in nearly 300 million years). But the Rb standard is comparatively inexpensive, compact, and widely used in TV stations, Mobile phone base stations and GPS systems and is considered as a secondary standard. [Max Carter] recently came into possession of just such a unit – a Lucent RFG-M-RB that was earlier in use at a mobile phone base station for many years. Obviously, he was interested in finding out if it was really as accurate as it was supposed to be, and built a broadcast-frequency based precision frequency comparator which used a stepper motor to characterise drift. The obvious way of checking would be to use another source with a higher accuracy, such as a caesium clock and do a phase comparison. Since that was not possible, he decided to use NIST’s time/frequency service, broadcasting on 60 kHz – WWVB. He did this because almost 30 years ago, he had built a receiver for WWVB which had since been running continuously in a corner of his shop, with only a minor adjustment since it was built. His idea was to count and accumulate the phase ‘slips’ generated by comparing the output of the WWVB receiver with the output of the Rb standard using a digital phase comparator. The accuracy of the standard would be calculated as the derivative of N (number of slips) over time. The circuit is a quadrature mixer: it subtracts the frequency of one input from the other and outputs the difference frequency. The phase information is conveyed in the duty cycle of the pulses coming from the two phase comparators. The pulses are integrated and converted to digital logic level by low-pass filter/Schmitt trigger circuits. The quadrature-phased outputs are connected to the stepper motor driver which converts logic level inputs to bi-directional currents in the motor windings. 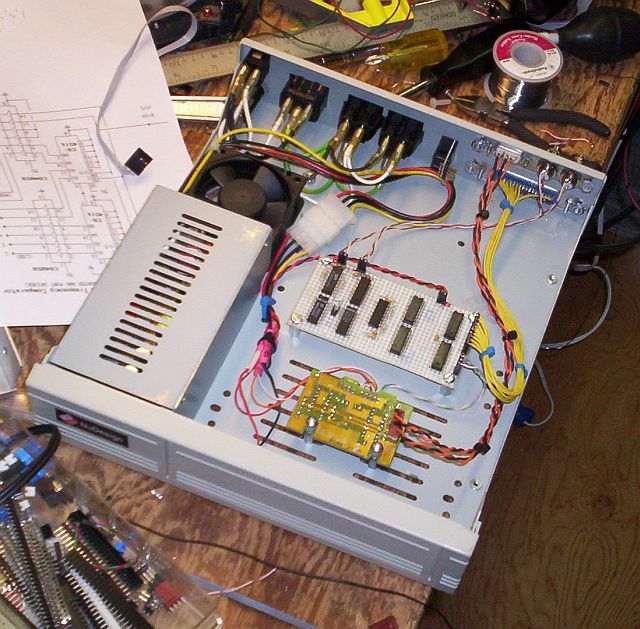 The logic circuit is bread-boarded and along with the motor driver, housed in a computer hard drive enclosure which already had the power supply available.